I have started this section off to cover those bricks one finds as coping and edging on bridges, etc. Wall capper from the NORI works in Accrington. Photo by Richard Matthews. 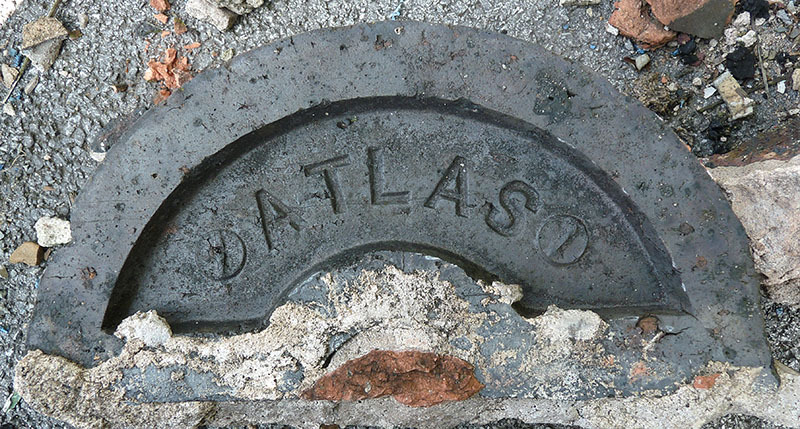 Barnett & Beddows, Atlas Brick, Pipe & Tile Works, Stubbers Green, Aldridge, Walsall. Atlas was their trade name. Info by Chris Deacon, photo by Darren Heywood. Spotted by Phil Shaw on a bridge over the entrance to a disused basin at Smethwick Junction. E & T Bayley, Great Bridge. 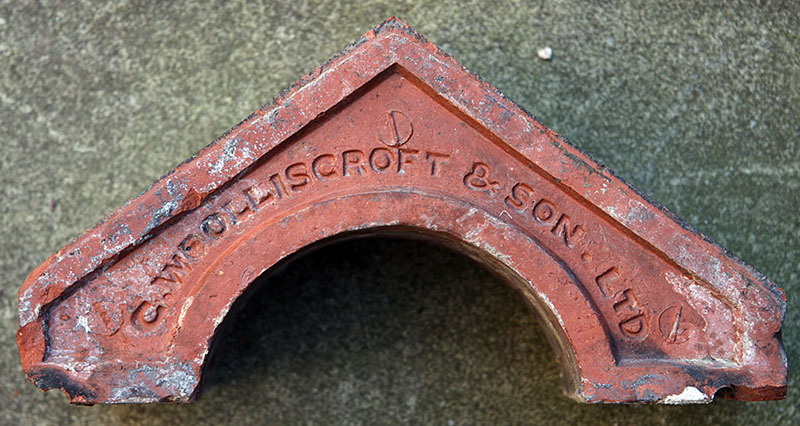 Found at a brick reclamation yard in Spondon by Martyn Fretwell. Edward & Thomas Bayley are listed in Kelly's 1872 edition at Great Bridge, West Bromwich. The listing for this works in Kelly's 1876 to 1904 editions is Thomas Bayley, Golds Hill Brickworks, Great Bridge, Tipton & this is followed by the entry of Thomas Bayley Ltd. at the same address in Kelly's 1912 to 1940 editions. The works closed in 1940. Photo & Info by Martyn Fretwell. 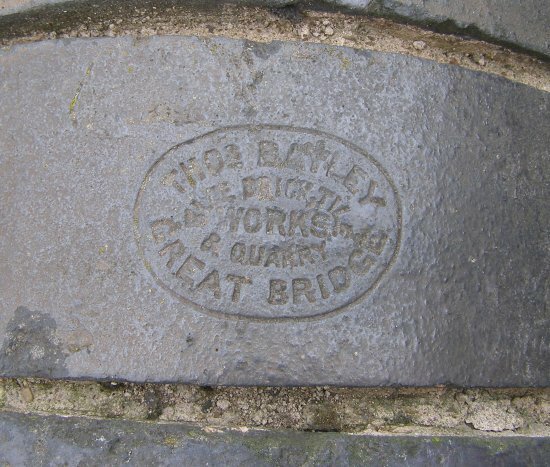 These were found on a bridge over the former Lancashire, Derbyshire & East Coast Railway just east of Bolsover Tunnel. The copings are about 18"x 6"x6". The railway opened in 1897 so the copings must be original. Photos by Simon Patterson. The location is the foot of one of the piers of the Harringworth/Welland Viaduct, specifically the one to the right of the road in this view. 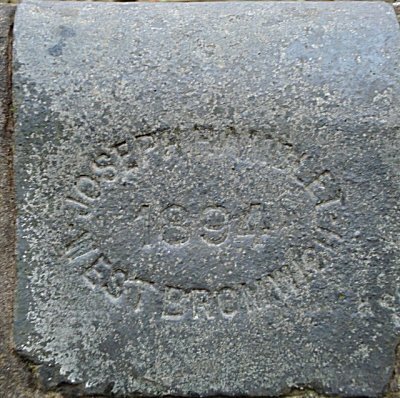 As this appears to be original brickwork, it can be dated to 1875-8. Photo and info by Alan Murray-Rust. Seen on locks on the Stratford on Avon canal. Photo by Richard Thorpe. 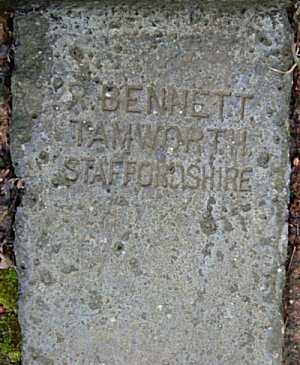 Pynson Wilmot Bennitt is listed in the Worcestershire Post Office Directory for 1876 as a Brick Manufacturer at Littlefields, Oldbury. 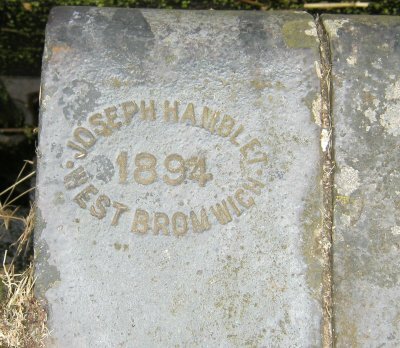 The 1871 census shows him as MA Oxford and Brickmaster employing 14 men, 4 women, 7 boys and 13 girls. In 1881 he is shown as employing 30 hands and by 1891 he had ceased to be in business and was living off his own means. 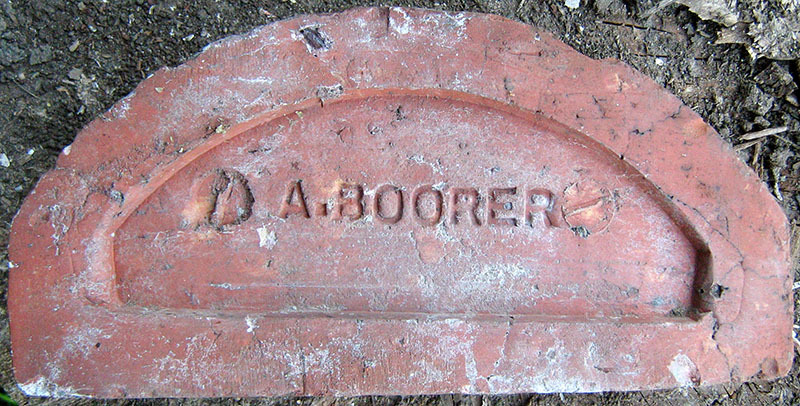 A Boorer, Crowhurst, near Oxted, Surrey. Photo by courtesy of the Richard Symonds collection. 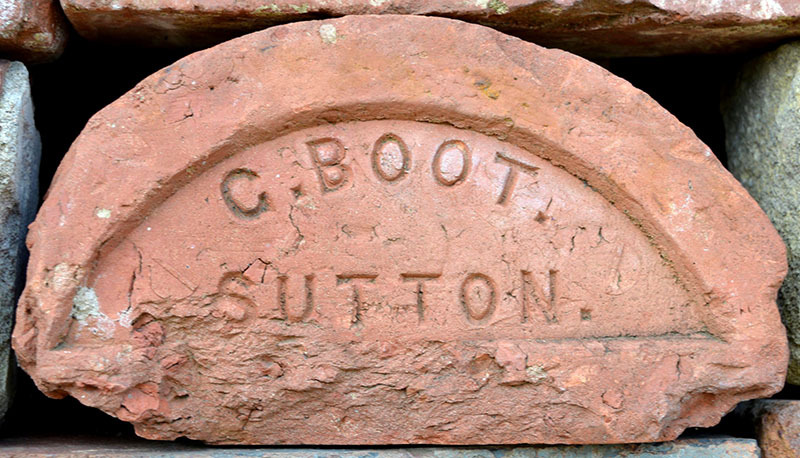 George Boot, Dalesforth Road, Sutton in Ashfield, Notts. Kelly's Nottinghamshire Directory 1908-1916. Photo and information by Frank Lawson. Made in Market Lavington, Wiltshire. 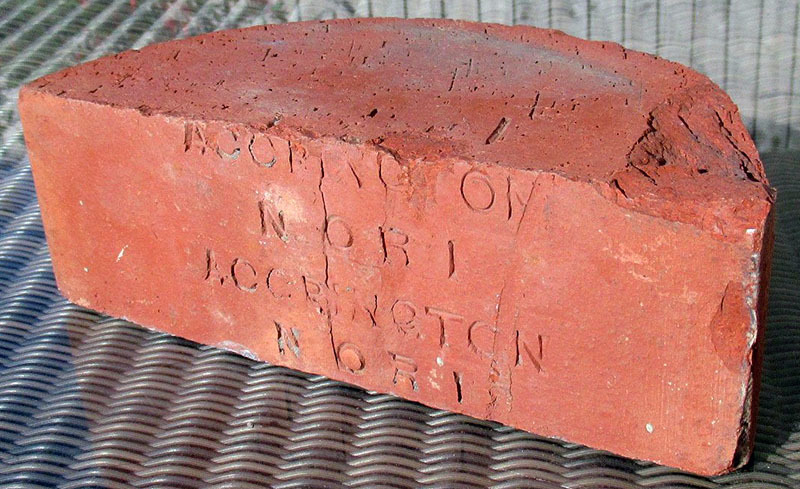 William Box owned the Market Lavington brick works for most of the second half of the 19th century. Photo by Rog. The Swan Lane brickworks, Nuneaton (now Croft Road) previously owned by Walter Handley was taken over Benjamin Broadbent, a Leicestershire builders merchant & Jacob Stanley in 1869. Shortly after forming this partnership Benjamin due to ill health took a back seat in the running of the company & Jacob's brother, Reginald took his place in running the yard. 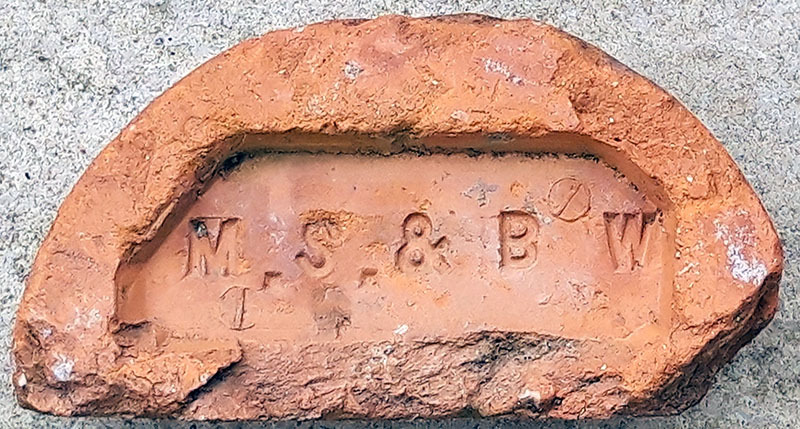 The partnership of B & S was dissolved in 1871 & the company was re-named Stanley Brothers. Photos courtesy of Sheryl Wrighting & this website. Full history of the company. Spotted on the beach at Crosby, Merseyside. 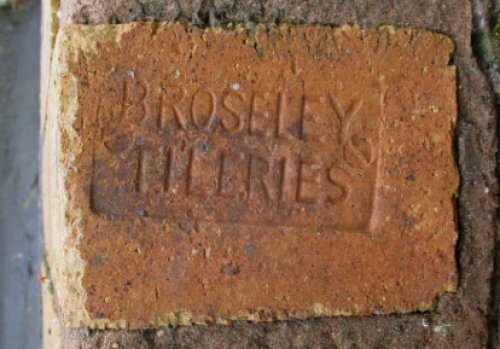 Broseley Tileries produced bricks between 1882 & 1954. Photo by Martyn Fretwell. 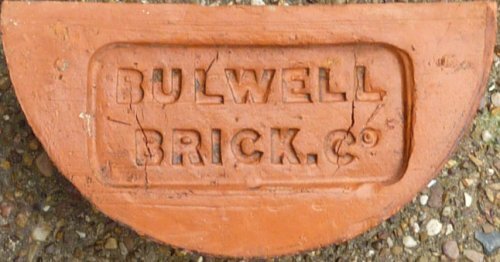 The Bulwell Brick Company had two works, one on Wells Road, Nottingham & this works is listed in Kelly's from 1891 to it's 1916 edition. The Kett Street works, Bulwell is listed from 1876 to it's 1932 edition, with this brickworks closing around 1940. Info and photo by Martyn Fretwell. 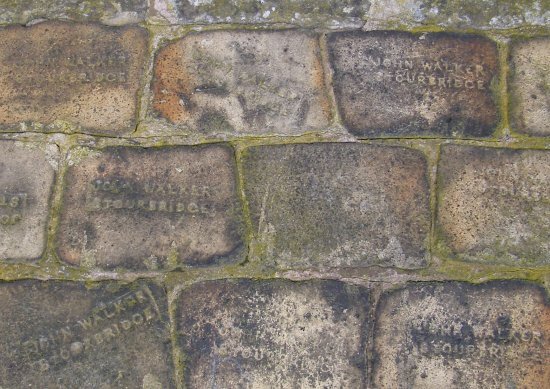 Photo by Lawrence Skuse, The P.P on the Burgoyne coping brick refers to "Pontypool" (from Little Mill, ,Pontypool). 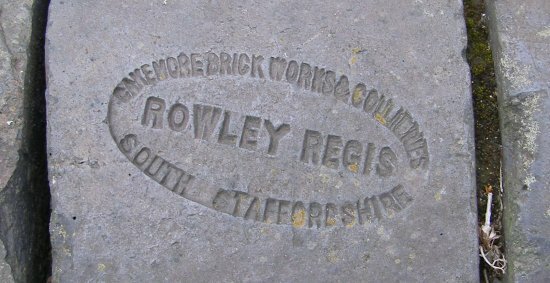 Cakemore brick works & collieries, Rowley Regis, South Staffordshire. 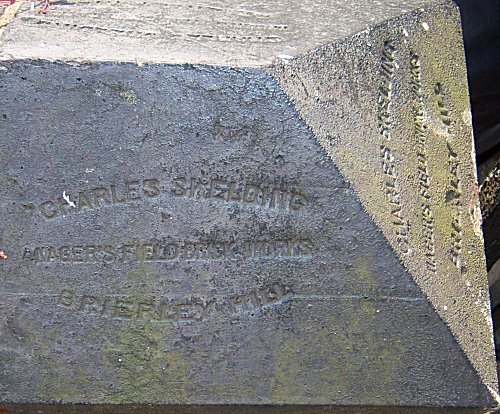 Charles Skelding, Nager's Field brick works, Brierley Hill, thanks to Velda for the contribution. 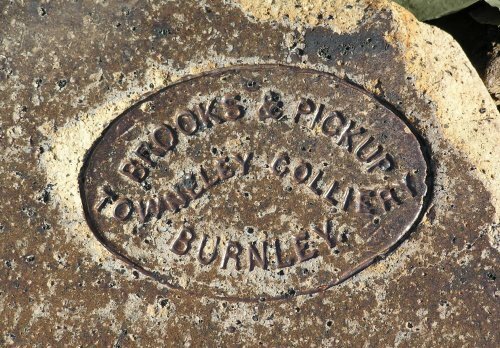 Coupe Brothers, Brickmakers who, according to several street directories, operated out of several addresses in Sheffield including Carlisle Street East & Sorby Street. Information from Frank Lawson and photo by David Kitching. The only trade directory found is for a W.B. 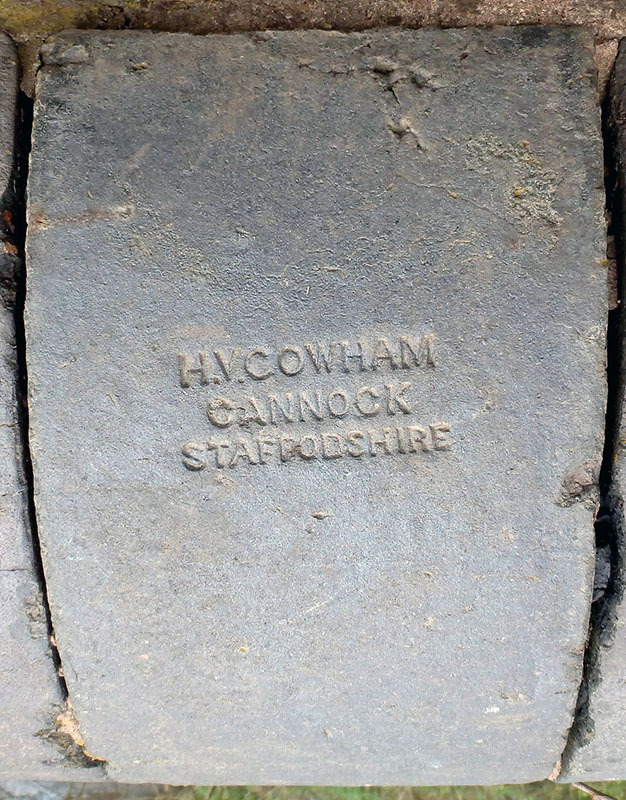 Cowham at Cannock in Kelly's 1868 edition, so I expect it is the same family. 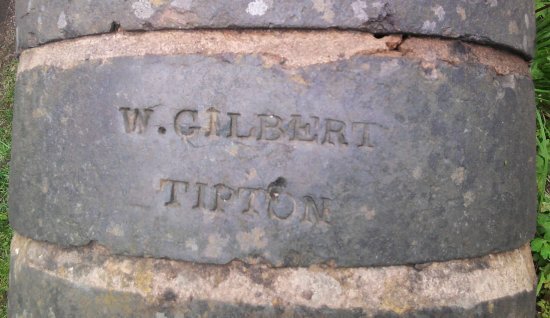 I recently spotted this copping brick on a small stream bridge at Rugeley near to Cawarden Reclamation Yard. Photo & Info by Martyn Fretwell. Found by Phil on Tatbank Road, Oldbury, West Midlands. 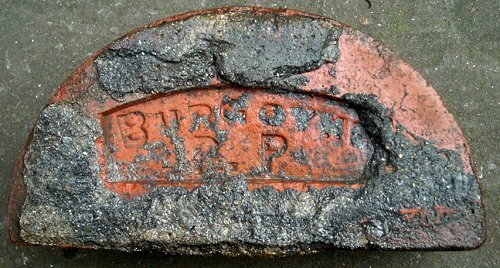 Found by Frank Lawson in the towpath of the Worcester & Birmingham Canal, Edgbaston, Birmingham. H.B. Eberhard is listed in Kellys 1860 & 68 editions at Waterfall Lane, Old Hill, Rowley Regis, Dudley. Info & Photo by Martyn Fretwell. Photo taken in Pontesbury by Michael Shaw. 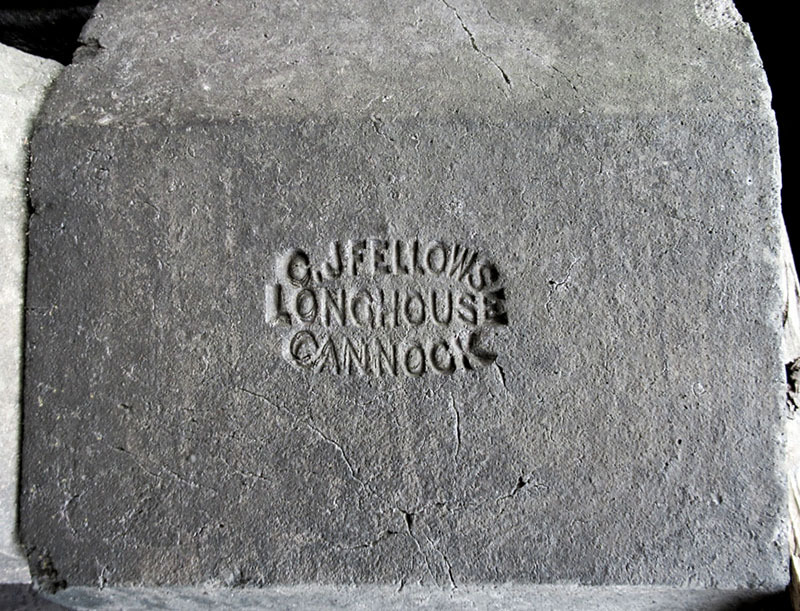 Charles J. Fellows, Longhouse Brickworks, Cannock is listed in Kelly’s 1872. This brickworks was next under the control of Henry Hawkins by 1888. Info & photographed at Four Oaks Reclamation Yard by Martyn Fretwell. 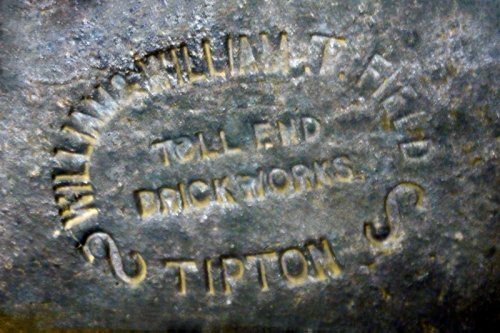 William & William T. Field are listed at the Toll End Blue Brick Works, Tipton in Kelly's 1880 edition. The entry in Kelly's 1884 edition is just for William Field. 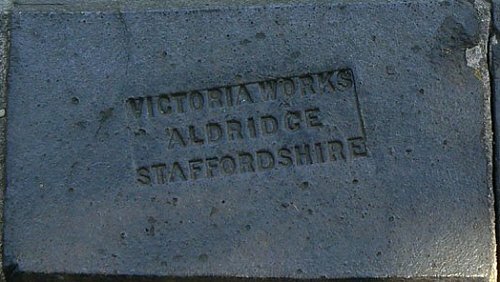 Kelly's 1868 to 1924 editions also records William Field as owning the Littleworth Brickworks/Tileries at Hednesford. Photo & Info by Martyn Fretwell. Phil spotted this one on a bridge over the Brades branch on the Wolverhampton Level of the BCN. and another found by Phil nearby. Spotted on the Walsall Canal, thanks to Phil for the photo. 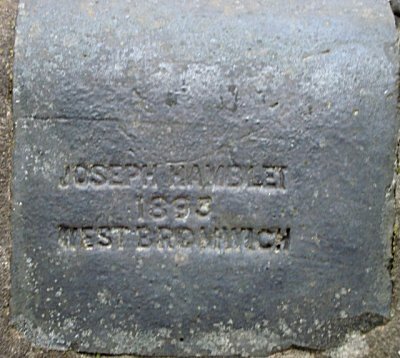 Joseph Hamblet founded the Piercy Brickworks in West Bromwich works in 1851 and it came to specialise in blue bricks. 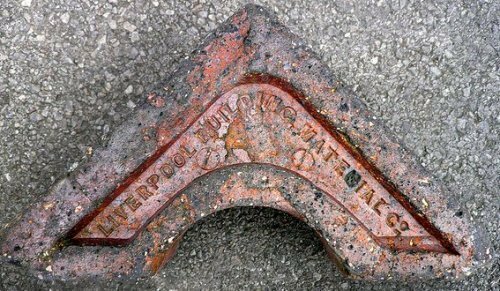 They were much in demand in the latter half of the 19th century for railway and other industrial construction. Some more from the L.D & E.C.R just east of Bolsover Tunnel. They are about 18"x 6"x6". The railway opened in 1897 so the copings must be original. Photos by Simon Patterson. line crossed the Midland Clowne branch line. Photo by Simon Patterson. Jeffrey Carter writes: The enclosed photo is from the lock edge of the newly reopened Droitwich canal. While we, The Coombeswood Canal Trust and BCNS undertook clearance testing with our pair of heritage working narrow boats 'Atlas' and 'Malus' for BW and Droitwich Canal Trust, June 2011. 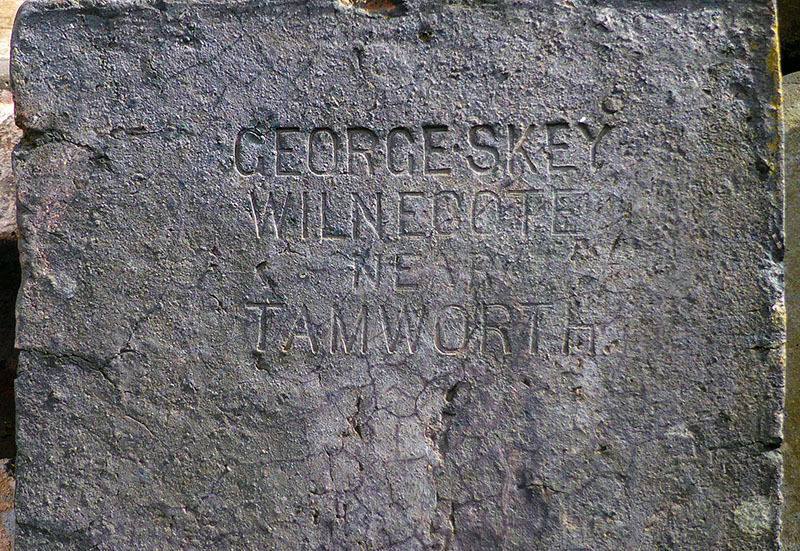 An 1865 example found by Darren Sladden in Great Dunmow. Photo taken by Jo Roesen at Broadway station Worcs. 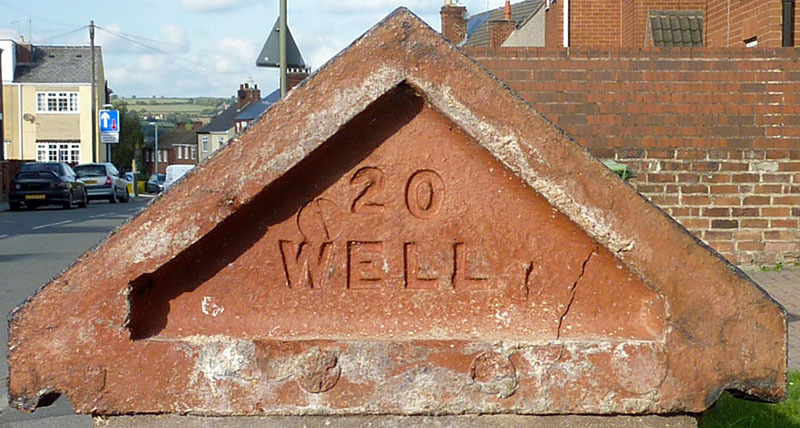 A brickworks site of the Hereford Brick and Tile Company. 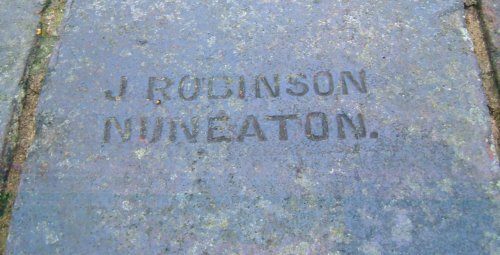 Richard Paterson writes: The Hampton Park Brick & Tile Works is described in 'Herefordshire Bricks & Brickmakers' by Edwin Davey & Rebecca Roseff (Logaston Press, 2007). 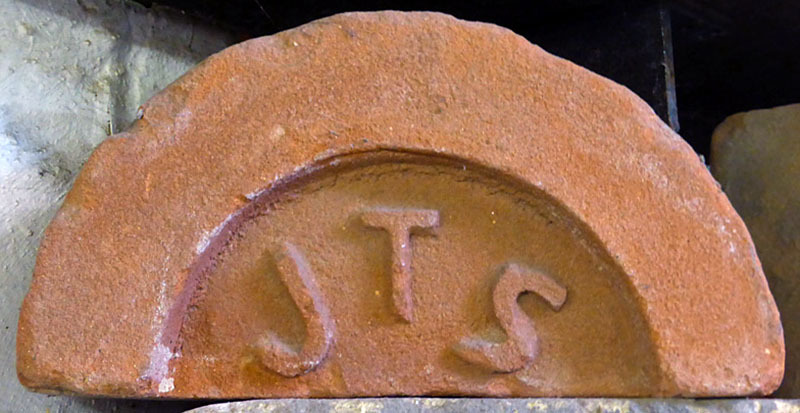 It was 'a large brick and tile works 2km from Hereford city centre. There were adjacent clay pits, up to 5 drying sheds and 4 kilns which were extant in 1886'. The book contains an interesting description of the works and operations by a Mr Eckley, who worked there in 1936 and 1937, shortly before the works closed prior to the outbreak of war. From 1939 to D-Day the site was used by the US military and it is now a recreation ground and nature reserve. Photo courtesy of Hereford Museum and Gallery, Herefordshire Museum Service. John Harper & Co. are listed in Kelly's 1876/80/84 editions at the Albion Works, Willenhall, Staffs. 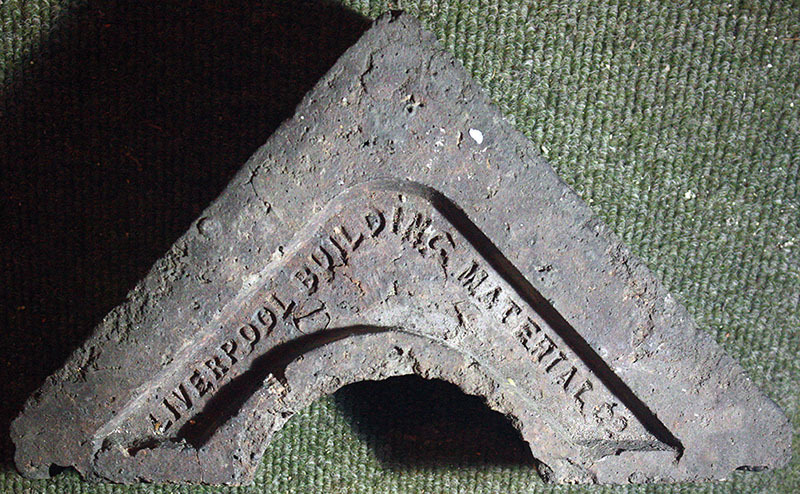 Primarily lock manufacturers the company also made bricks at their Albion Works which were used to build extensions to their existing buildings. Info & Photographed at Four Oaks Rec. Yard by Martyn Fretwell. 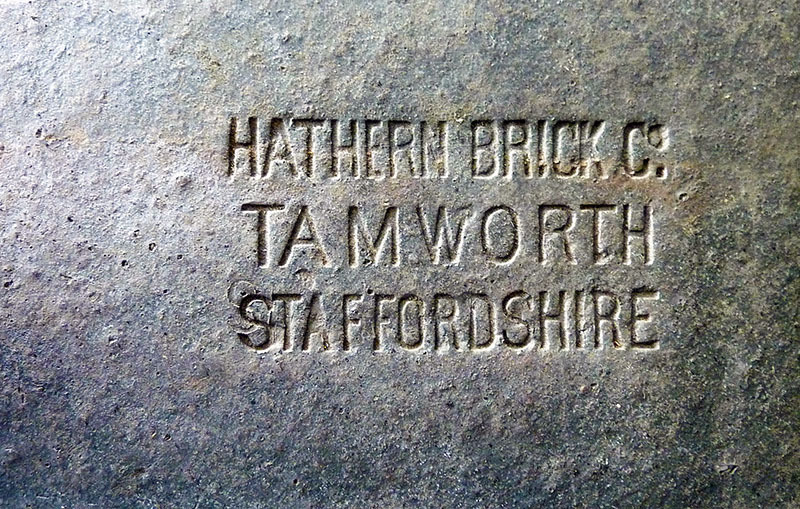 Owned by the Hathern Station Brick & Terra Cotta Co. near Loughborough, the Hathern Brick Co. operated it's Cliff Brickworks near Kingsbury, Tamworth, Staffs. between 1882 & 1961. Today the site of this former brickworks is now the clay pit to Wienerberger's Kingsbury works and this modern works was built on the site of Whateley Colliery and it's brickworks. 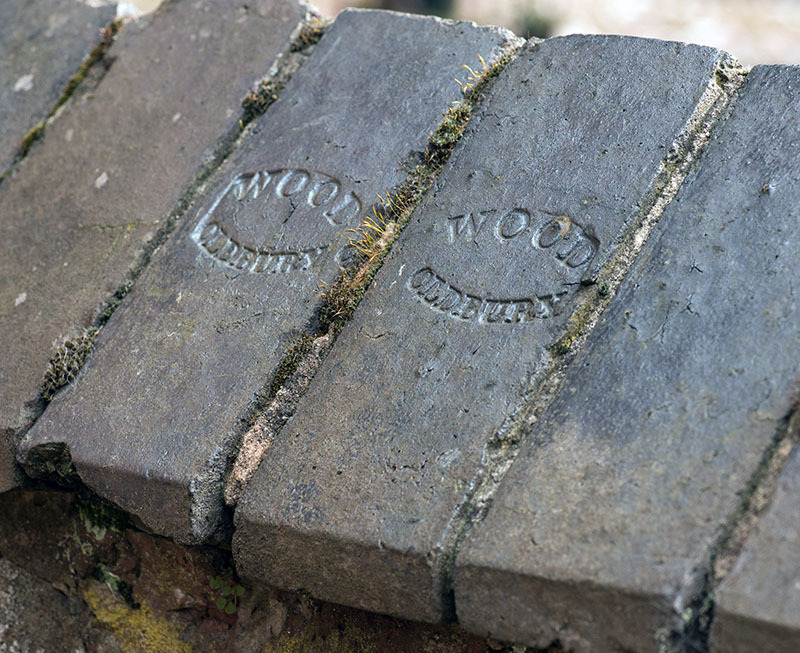 I photographed this copping brick on a disused Nottingham Suburban Railway bridge in Woodthorpe Grange park, so this brick can be dated as being made before 1889 when the railway opened. An aerial view of the works. Photo & Info by Martyn Fretwell. 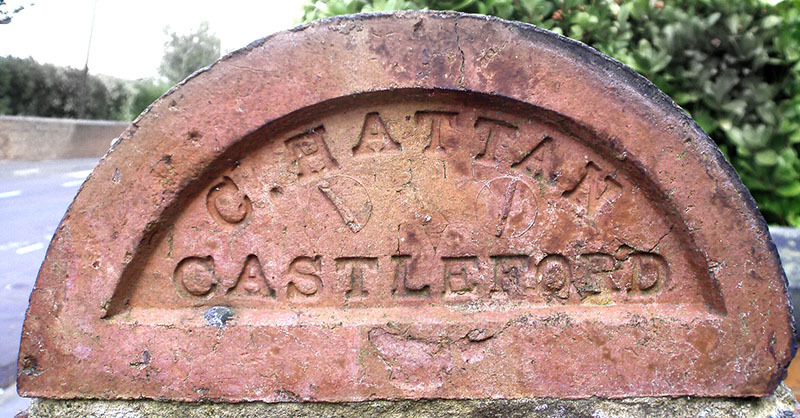 Chas Hattan was one of several brickmakers in the Castleford area. 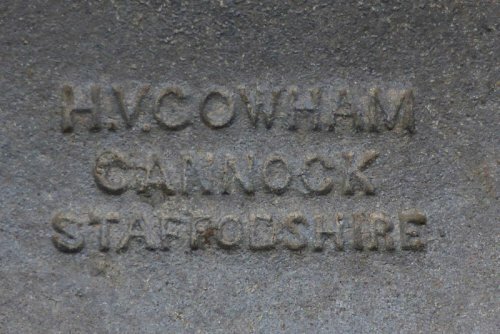 Listed in trade directories at Glasshoughton 1908/ 1912/ 1917 and at Middle Oxford Street 1927 / 1938. Castleford, West Yorkshire. Photo by courtesy of the Frank Lawson collection, taken in Normanton. Spotted in Sheaf Street, Sheffield by AKA Demik. Spotted on a railway bridge in Nottingham. 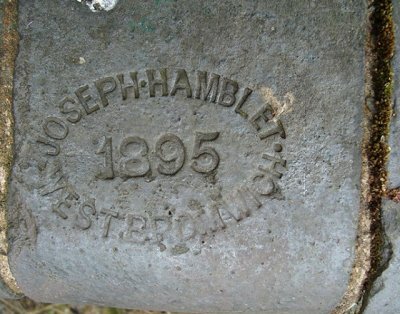 The bridge was built in the 1930s, which dates this particular style of stamp. The stamped bricks are on the approach ramps rather than the bridge itself which has had the parapet slightly raised at some point. Photo and info by Alan Murray-Rust. 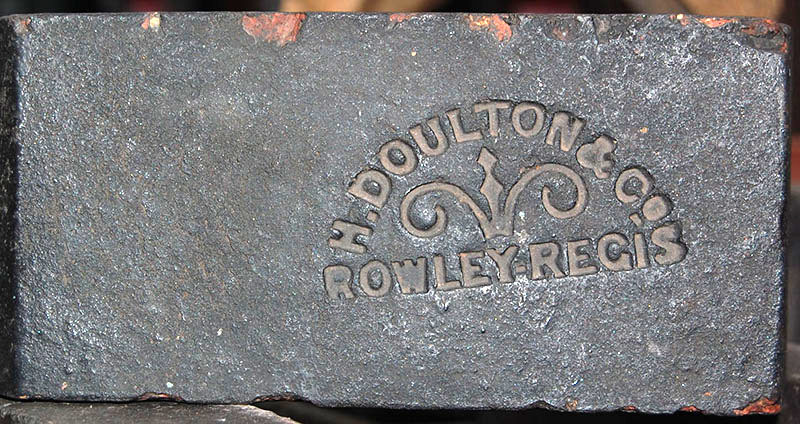 This is thought likely to be a product of Hobley & Burgess of Albion Street, Willenhall Staffordshire. They appear in Kelly's Directory for 1872. Photo by Martyn Fretwell. Photo by Ray Martin. 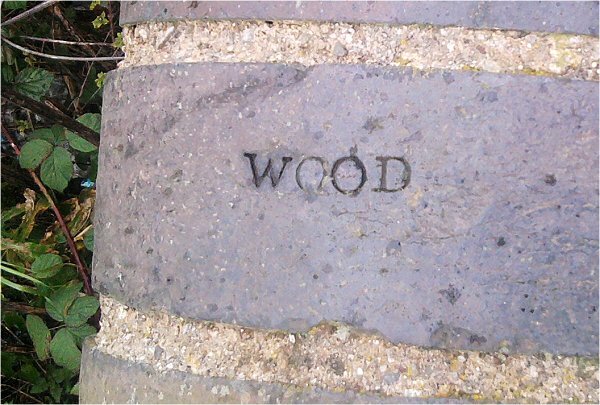 See the entry for Wood & Ivery in the bricks section for more details of the company history. Found in Wednesbury by Steve Thorpe. 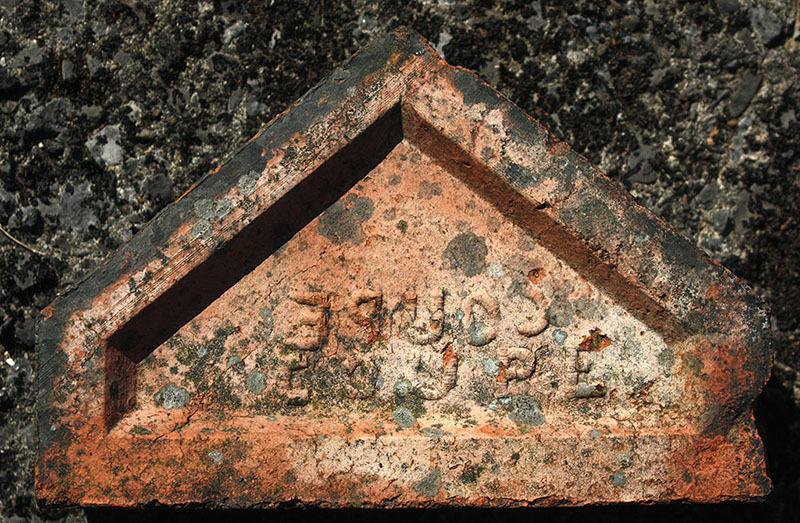 Martyn Fretwell writes ;- Edward Jones & Co. (blue, red & ridge), Old Groveland Brick Works, Dudley Port, Tipton. Kellys 1884. Made by Joseph King, Chapel terra cotta works, Netherend, Park Lane, Cradley, West Midlands. Photo by Michael Raybould. 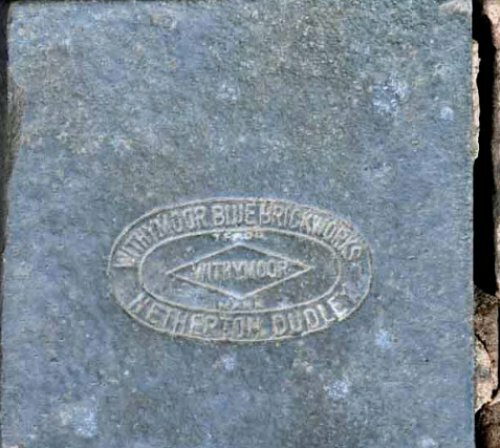 A Maltby Metallic coping brick made in South Yorkshire. 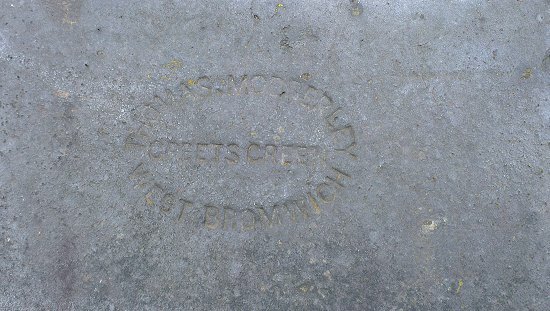 Found by Alwyn Sparrow on a railway bridge abutment in Warwick. 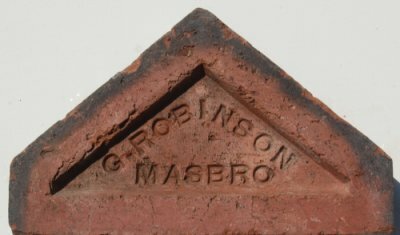 Richard Mason & Sons, Crown Brick Works, Toll End, Tipton. 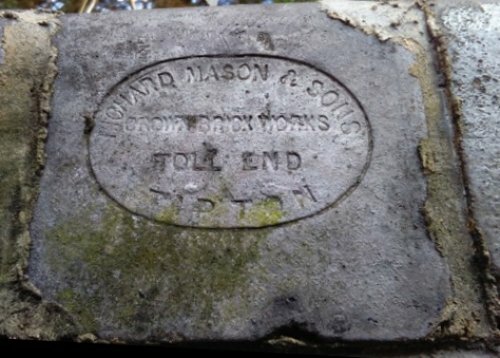 Richard Mason & Sons are first recorded in Kelly's 1884 edition, then the entry from the 1896 edition to the 1916 edition is Mason Ltd, (blue & red), Toll End, Tipton. Present day Bayleys Pool on Toll End Road is where they dug the clay from for the Crown Brickworks. Photo & Info by Martyn Fretwell. Found by Simon Patterson in Creswell N.E. Derbyshire. Photo by Martyn Fretwell. Nostell is a village near Wakefield, West Yorkshire. The works is still open today as part of Ibstock Brick. Parkinson & Spencer, Ambler Thorn, Halifax. 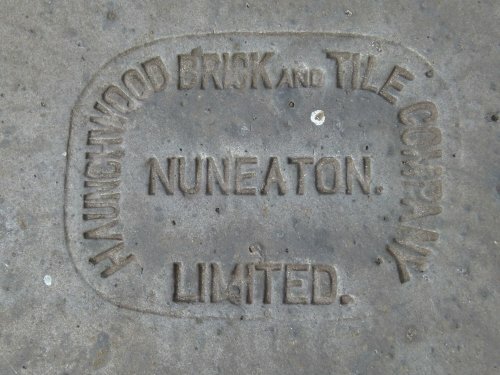 Listed from 1917 in trade directories and still operating as Parkinson & Spencer Refractories in August 2012. Seen at the Bracebridge Lock on the Chesterfield Canal at Worksop. Info by PRBCO, photo by Darren Haywood. 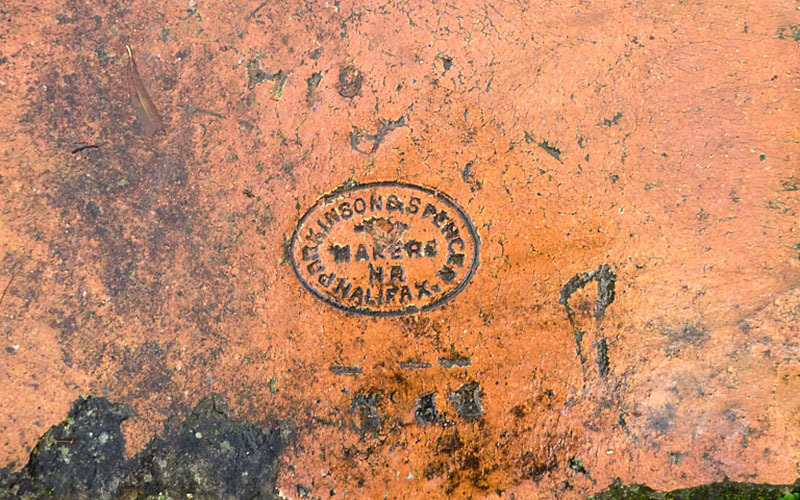 Found on a wall at Brimington, Chesterfield by Simon Patterson. 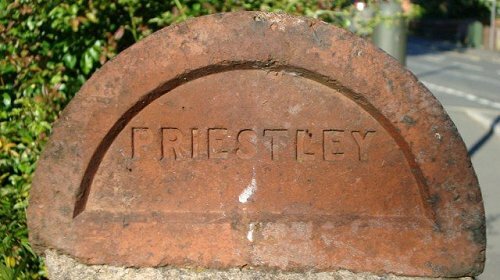 Simon adds this information: From the 1881 census Henry Priestley age 24 brick manufacturer living Sheffield Rd. 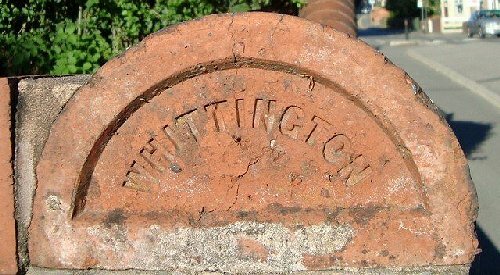 Whittington. From the 1891 Kelly's Directory for Whittington: Henry Priestly Grocer, Draper and Brickmaker, The Brushes, Whittington. Photo taken in Copthorne Road, Shrewsbuy by Michael Shaw. Seen at Easton Neston by Nigel Furniss. 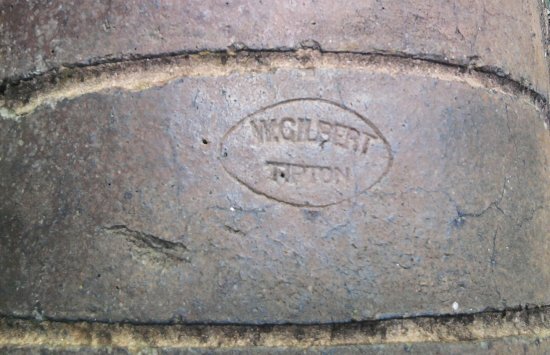 George Shelton & Son are listed in Whites 1875 edition with the address of Sheepcote Street in the Brick & Tile Manufacturers section. 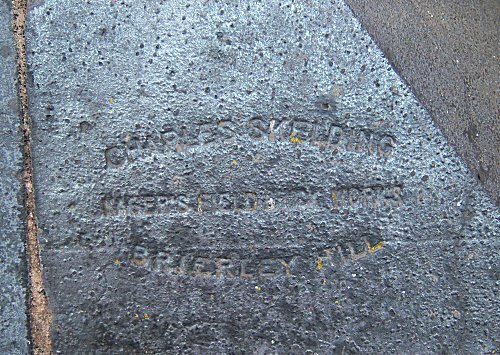 The rest of the listings 1876 to 1940 for this company, either as George Shelton & Son, James Shelton & Co, or Shelton & Co. then appear in the Brick & Tile Merchants section at Sheepcote Street & in some at 58, Water Street. 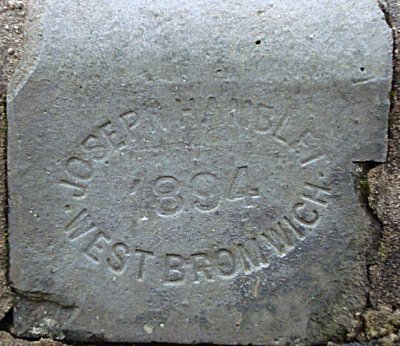 So it appears this company was only making coping bricks around 1875 at a location which is unknown because old maps show both Sheepcote Street & Water Street are next to the canal in the centre of Birmingham in built up areas, so these address will have been the company’s sales & distribution depots. Photo & Info by Martyn Fretwell. See Skey brick entry for info. Photographed at Four Oaks Reclamation by Martyn Fretwell. 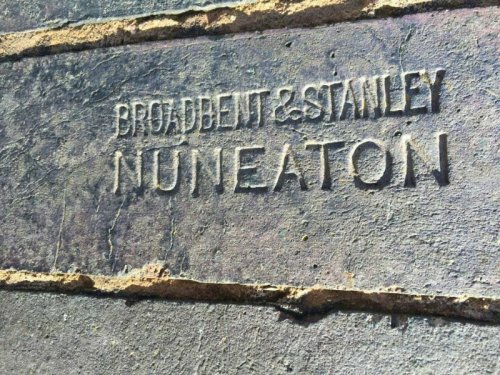 Started in 1895 as Stanley Brothers Ltd. covering 145 acres at Stockingford on Nuneaton Common. 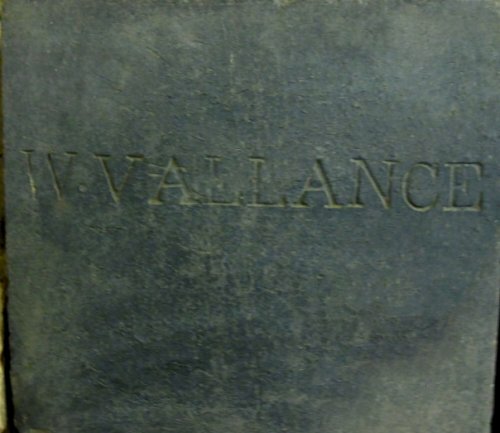 They were one of the largest manufacturers of clayware products in the U.K., supplying over 4,000 customers in 1895. 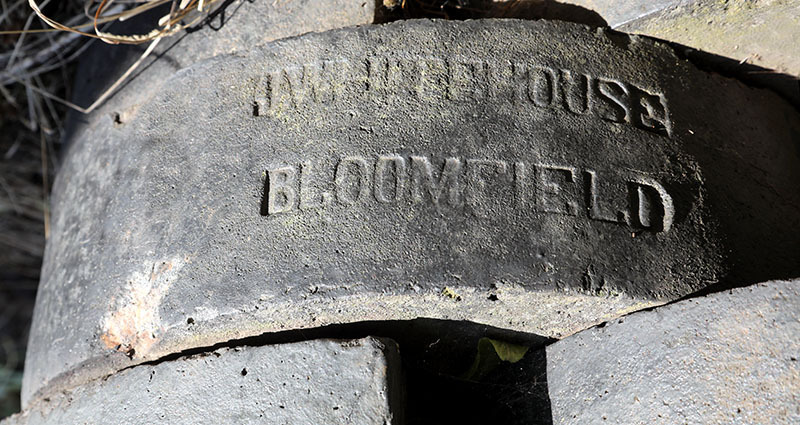 There were also separate brickyards owned by the company, and they operated two collieries. They were worth over '114,000 in 1895, (over '11,500 million today) !! Most of the sites have been redeveloped for housing, the works finally closing on 31st January 1988, but most of the commercial records have been saved. 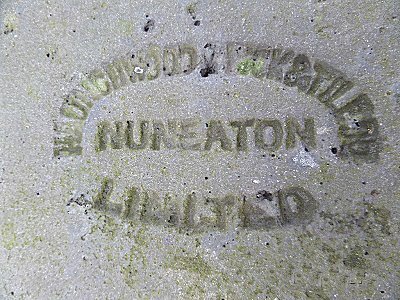 Further reading is to be found in the book NUNEATON & BEDWORTH COAL, STONE, CLAY & IRON by Peter Lee. Photo and info by Nigel Furniss. E.D. 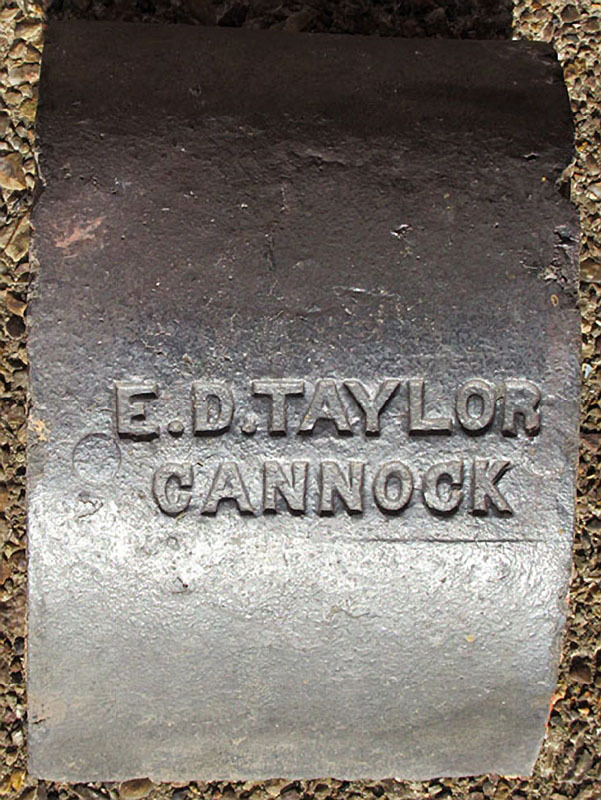 Taylor, Cannock, Stafford is listed in Kelly's 1860 edition. Info & photographed at Cawarden Reclamation by Martyn Fretwell. John Taylor, Sible Headingham, Halstead, Essex is listed in Kellys 1886 edition. Photo & Info by Martyn Fretwell. Photo by Martyn Fretwell. 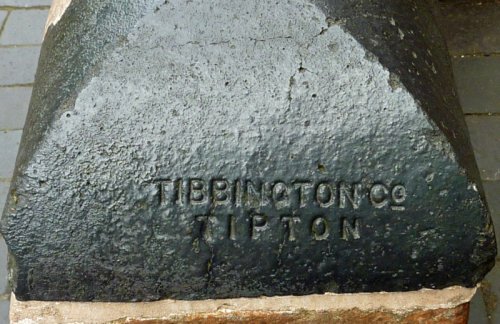 Tim Lawton writes: I believe this was made at the Twentywell Brickworks located in Bradway, Sheffield, adjacent to the railway cutting off Twentywell Lane. From what I can glean from the old ordnance survey maps, the works was in operation from at least 1875 through to the 1950s (maybe later). Interestingly the works seemed to manufacture stoneware also. Malcolm Adlington adds: Twentywell closed in 1939, but wasn't demolished until the late 1950s or early 1960s. No Info - Photo by Martyn Fretwell. 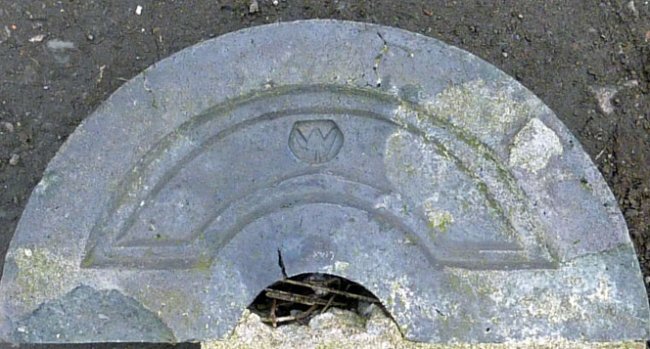 This one forms part of the coping to the churchyard wall at Bleasby, Notts, photo by Alan Murray-Rust. Photo by Ray Martin, taken at Sutton Coldfield station. 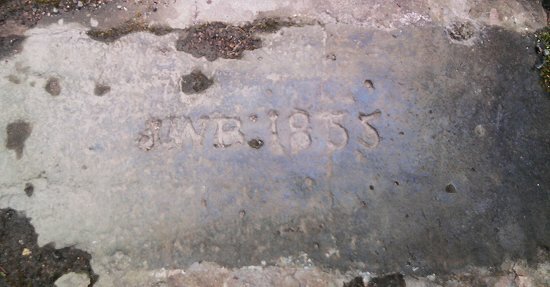 Spotted by Phil Shaw in a wall at the side of lock No.1 on the Smethwick flight. Photo by Simon Patterson, found in Dudley. Thomas Walton is listed in Kelly's 1868 to 1880 editions at Dudley Port, Tipton. In 1872 Thomas was living on Park Lane, Tipton & is recorded as taking out a seven year lease on a brickworks in Dudley Port from the Dudley & West Bromwich Banking Co. Info & Photographed at the Black Country Living Museum by Martyn Fretwell. 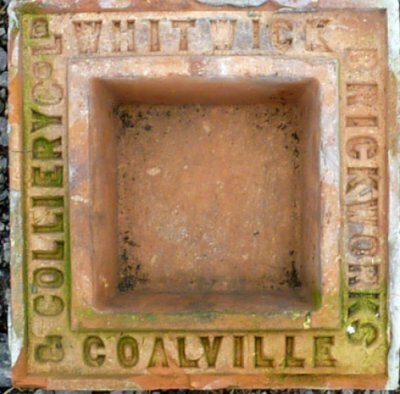 Whitwick Colliery was in Coalville, Leicestershire. 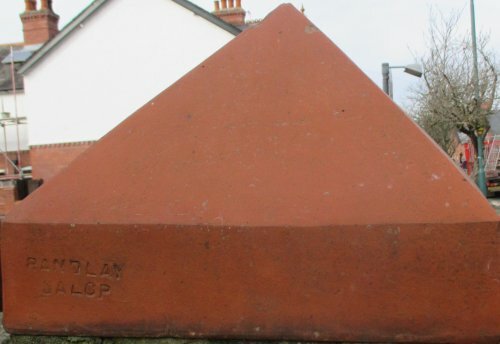 This is the underneath to a coping brick which formed a ridge of bricks along the top of a wall. Photographed at Cadeby Reclamation yard by Martyn Fretwell. Spotted by Phil Shaw on a bridge at Dudley Port Junction on Birmingham Level BCN. On a garden wall. Photo by Tim Geater. Photo by Nigel Megson, found at Stubbs Bridge, Womersley, Yorks. 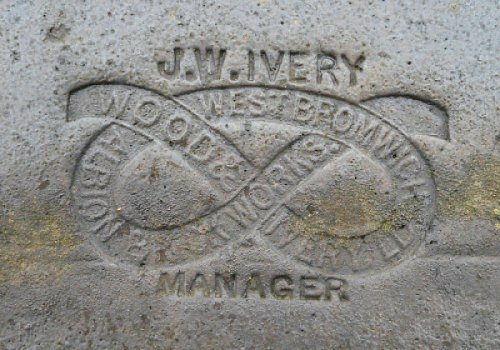 See the entry for Wood & Ivery in the bricks section for more details of the company history. Seen on lock 29 of the Stratford on Avon canal. Photo by Richard Thorpe. 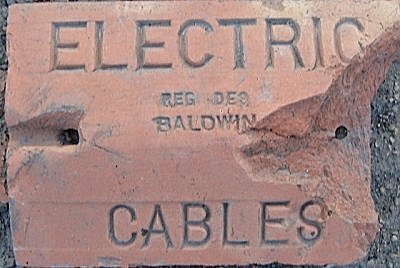 A terra cotta cover for electric cables, made by Baldwin. Thanks to Simon Patterson for the photo. 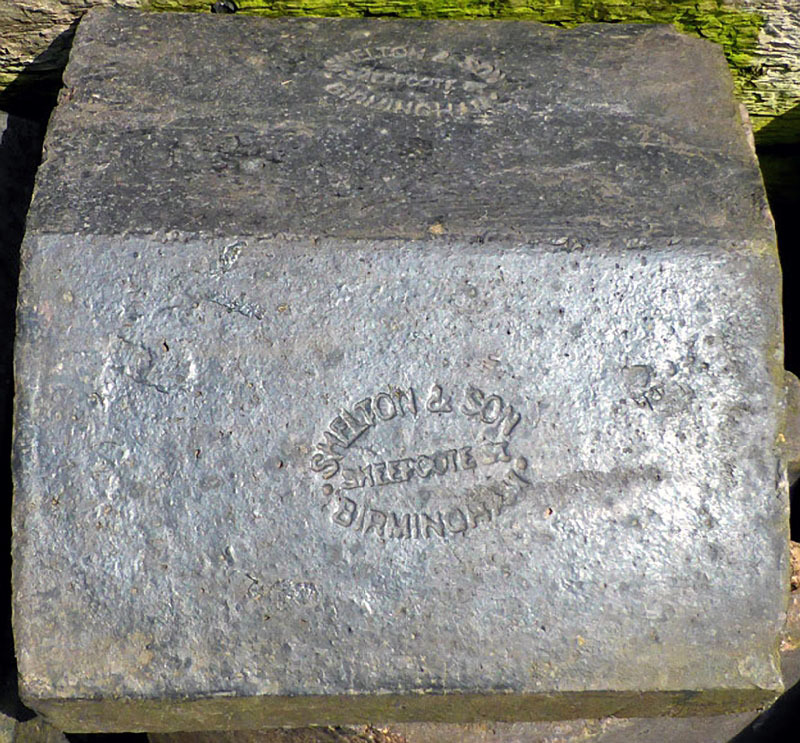 This is a a "holed" refractory brick found at the site of a disused ironworks at New Inn, Pontypool by Lawrence Skuse. 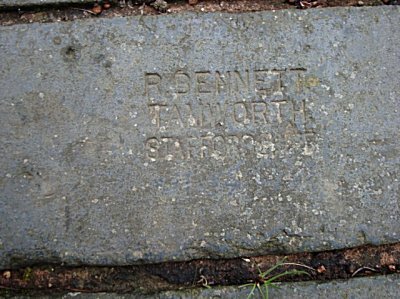 This is unattributable, but was found with some standard Southwood Jones bricks, and most fire bricks at this site are Southwood Jones, both from Risca and Pontypool. 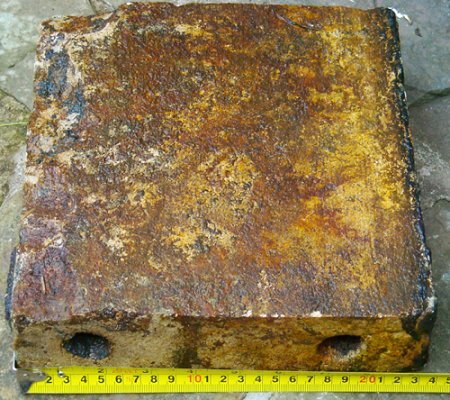 The brick is 9 x 10 x 2 1/4 inches, the holes have a 1 inch bore and go all the way through the brick.